Revenue in the Paper Tissues segment amounts to US$2,783m in 2019. The market is expected to grow annually by 2.0% (CAGR 2019-2023). In global comparison, most revenue is generated in China (US$1,855m in 2019). In relation to total population figures, per person revenues of US$3.68 are generated in 2019. 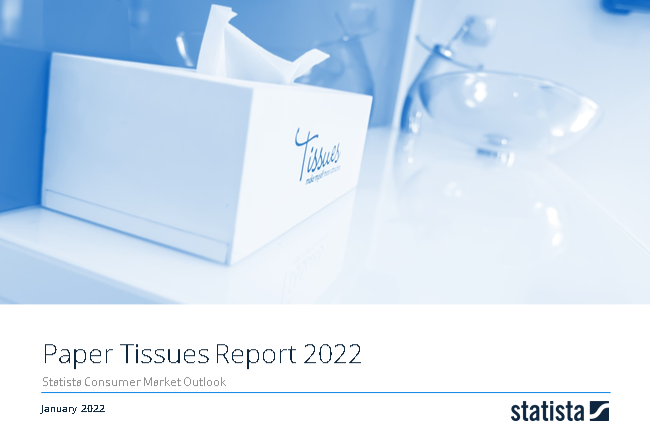 The Tissues market segment includes tissue are made from pulp and facial tissues. The market includes retail sales and whole sales. The consumer share of each segment is valued at retail prices (incl. VAT) whereas the AfH tissue is valued at wholesale prices (excl. VAT). The average price shown is therefore an average of both the retail and whole market. The most important manufacturers are SCA, Procter & Gamble, Kimberly-Clark, Unicharm, Hengan, Sofidel, and Metsä which produce both under their own brands as well as for retailer brands. Reading Support Revenue in the Paper Tissues segment amounts to US$2,783m in 2019. Reading Support The Paper Tissues segment is expected to show a revenue growth of 2.1% in 2020. Reading Support The average revenue per person in the market for Paper Tissues amounts to US$3.68 in 2019. Reading Support In the market for Paper Tissues, volume is expected to amount to 988.2 mkg by 2023. Reading Support The market for Paper Tissues is expected to show a volume growth of 2.0% in 2020. Reading Support The average volume per person in the market for Paper Tissues amounts to 1.2 kg in 2019. Reading Support The average price per unit in the market for Paper Tissues amounts to US$3.03 in 2019. Reading Support With a market volume of US$1,855m in 2019, most revenue is generated in China. Here you can find more studies and statistics about "Paper Tissues".